Is there a good story for this? Let me start this by saying that I love thinking about games, writing about games, playing games, and experiencing the memorable stories that we create through games. I am an active participant on RPG-related online forums. I created this blog to help people play games, have more fun, and push the limits of the hobby. I believe roleplaying is an artform, and like any art, worthy of study and critique. I play, I write, I read, and I analyze. All of this is to say: I have read an awful lot of RPG stories. From fa/tg/uys posting greentext on 4chan to desperate cries for help on Reddit, I have read everything from classics like the Dread Gazebo and Tucker’s Kobolds to modern serializations like the All Guardsman Party. I consume podcasts voraciously, listening to actual play sessions, where RPG stories are created, and discussion formats, where they are discussed. I have come to the conclusion that I hate reading RPG stories. RPG stories are a surprisingly unique form of fiction. These stories are inspired by imaginary events created collaboratively by group of people, experienced ephemerally, and imprinted on memory. The inspiring events often occur spontaneously, at the whims of the dice rather than the will of the participants, and it often is not until well after the fact that players realize they had a moment worthy of memorialization in an RPG story. Eventually, someone decides to share those events, and the RPG story is born: either written for distribution via online forums, email, and the like, or committed to memory to be shared with other gamers when it comes time to swap stories. Tales from the tabletop usually come in two formats: novelized portrayals of imaginary events or historical recording of the meta-actions that created those events. The former focus on presenting in-game events as the subject of a fictional tale divorced from the tabletop RPG that created them. The latter focus on presenting the game and its players as the subject, reconciling in-game activity with the players’ real-world actions. After the first chapter, which is titled “Darwinian Character Creation” so I’m sure you can guess its subject, the aforementioned All Guardsman Party falls firmly in the novelization camp. What starts as a story about a weekend of gaming becomes an in-universe telling of the exploits of Sarge, Doc, Nubby, Twitch, and Heavy spanning thousands of words and numerous chapters. Without knowing it was written about a series of tabletop RPG sessions, you might think it was simply a zealous form a fan fiction, because, for all intents and purposes, it is fan fiction. I don’t read these RPG-inspired short stories as often as I would like, but I do not mind them. In contrast, Eric and the Dread Gazebo is a story about the events at the table. The narrative sets the stage for the game, following a player interacting with the Dungeon Master. The in-game events are there, but they are filtered through the lens of real-world interaction between players, the DM, and the dice. These RPG stories focus on the creation of the inspiration, rather than the inspiration itself. These are the most common, and I can’t stand them. The problem with these tabletop-and-player focused stories is that they never have sufficient context to recapture the moment. A thousand words cannot accurately recreate the social dynamics at the table, bring the reader’s investment in the characters in line with that of the players’, or provide the background necessary to accept fantastical results as plausible. In the same way that suspension of disbelief is the bedrock of a fantasy narrative, the reader of an RPG story needs implicit buy-in. He has to accept that, in spite of having only the briefest exposure to the players, characters, social dynamics, and context of the story, he will meet the author half-way. The simplest form of implicit buy-in is when the reader concedes his need to know the history of the characters and Big Bad Evil Guy, and just accepts that BBEG is Big, Bad, and Evil. One of the most challenging hurdles for implicit buy-in is acceptance of the shortcomings of the people in the story. RPG stories are not under the control of a single source of truth–the author–the way that traditional fiction is. Each character in-game is controlled by a person, in the moment, without a chance to edit after the first draft. Characters, therefore, suffer from all of the qualities and flaws of their backstory and personal history, as well as the qualities and flaws of the player controlling them. The bleeding of a player’s personality into his character’s personality is no big deal in the moment, at the table, when everyone is improvising. When committed faithfully to words for distribution to outsiders, it can create glaring plot holes. The reader, going into the RPG story, must accept these plot holes as part of his implicit buy-in. I do not do this. I cannot do this. I am naturally analytical and I cannot turn it off. I have shared a few RPG stories (you cannot spend as much time with RPGs as I do without sharing at least a few), but I have abandoned drafts of so many more. Once I put the metaphorical pen to paper, I just cannot help noticing the glaring holes in the story from our table. Once, early on in a Dark Heresy campaign, I had a character execute another PC in cold blood, in front of the party. I thought it would be a great, shareable RPG story. From a gaming group perspective, it made perfect sense, because the PC’s player was from out-of-town and only visiting for that session. I saw the chance to have my character tie up a looming out-of-game loose end, my character provided flimsy reasoning to the party, the group accepted it, and the campaign went on. It was a dramatic end to a session, and the players at the table loved it. As soon as I got home, I drafted a retelling of the events to share. It was terrible. The in-game actions made no sense and the flimsy justification that the party accepted (primarily for out-of-game reasons) was a sham. As a player, I looked antagonistic. Mechanically, the victim player declined to use his character’s various abilities to avoid such a death, which obviously makes no in-character sense. The whole thing read like a terrible cop-out. The irony is that we reference that night all the time within our group; it has easily become one of the hallmarks of our shared gaming history. It was a great story in the moment, but I guess you had to be there. I do not just hate reading other people’s RPG stories, I hate reading my own. Why Do We Share These? Sitting at a tabletop is a social experience, and RPGs are social games. 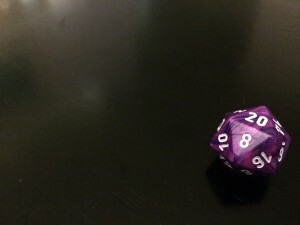 Tabletop RPGs also offer a unique element of creativity unavailable through media like video games and board games. The hobby therefore attracts not only creative-types, but highly social creative-types, who naturally want to share their experiences. Gamers such as myself, I would like to think, appreciate the instructive anecdote. I spend a lot of time thinking about how to make games better, and a lot of problems and solutions are easily illustrated through anecdotes. When a DM is looking for help with a story problem, for example, the best solution is dependent on the nature of his group and the story to date. To help him, I need the brief summary of his game, as well as a brief illustration of my solution. I love reading and writing these. As a more optimistic alternative, I try to view RPG stories as a framework for demonstrating my gaming ethos of continual improvement. My analytical side cannot help but rip an RPG story apart, just as I tore apart my own Dark Heresy tale, but I can at least use this analysis to teach others and enhance the hobby. I skim the text and say, “I’m glad your group enjoyed the game, but why didn’t the BBEG just use this very obvious low-level spell to counter the party?” Because gamers draw their inspiration from so many places, including other gamers’ experiences, I feel there is value in giving such sources of inspiration a fair, and even zealous, critique. Reading RPG stories has made me a better gamer, a better critic, and a better writer. The habit has yielded both personal inspiration and cautionary tales. In many ways, my hobby of writing about tabletop RPGs couldn’t exist without these RPG stories. But, I have to confess, I really hate reading them. This entry was posted in Sunday Morning Confessional and tagged d&d, Dark Heresy, dnd, Dungeons and Dragons, RPG. Bookmark the permalink.